Also Serving Newark, Heath, Granville and Surrounding Areas. Brown’s Transmission & Full Service Auto Repair is a third generation automotive repair center and has the knowledge and experience to fix your vehicle right the first time. Brown’s Transmission and full service automotive repair shop has a proud history in the Newark and Licking County areas. 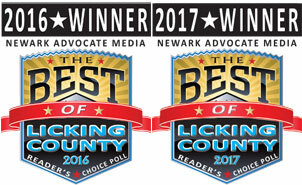 We are proud of our reputation as one of Newark’s oldest family repair shops, and we are committed to providing our customers with TOP QUALITY PRODUCTS and services at a competitive price. Our transmission specialists are trained and qualified to work on automatic and standard transmissions and have become the trusted expert in analysis, service, and maintenance of transmissions. Proper wheel alignment will greatly increase the life of your tires and help with fuel efficiency. We have state of the art alignment equipment to ensure that you have a safe journey on the road. Your vehicle’s computer has control over many systems within your car or truck, and ignoring check engines lights and other warning lights can cause unwanted damage to your vehicle. At Brown’s Transmission & Auto Repair, we use state of the art diagnostic equipment to analyze your vehicle’s on-board computer to check for faulty sensors and related issues. Brown’s Transmission Repair has become the trusted expert in the diagnosis, service, and maintenance of automatic and standard transmissions, since starting up in 1959. After assessing the situation with your transmission, we will give you upfront information on what needs to be done to get you back on the road. If your transmission does require repair, Brown’s Transmission will rebuild your transmission right. We have two full-time transmission technicians dedicated only to repairing and rebuilding transmissions. We also back up our work with a 2-year, unlimited mile warranty. We know transmissions and when the time comes that you need transmission service, no one does it better than your local Brown’s Transmission expert technicians. We work on any type, make, or model of vehicle, and whether you drive a car, truck, or SUV; manual or automatic transmission; foreign, domestic, luxury or economy, we know your transmission. We have a huge stock of transmissions at our shop to get you in and out much quicker than the other guys. Worried about the cost of a transmission repair? Some people believe rather than mess with a transmission repair, they should just buy some new wheels. It’s important to understand the true costs of buying a new vehicle (or a used vehicle) before going down that path. If you buy something new, you have to deal with acquiring a new loan and car depreciation. A new vehicle loses most of its value in the first five years you own it, and you will lose thousands of dollars as soon as you drive off the dealer’s lot. If you buy a used vehicle you may just inherit someone else’s problems. Not to mention, if you plan on trading in your vehicle with a transmission problem, the value they give you for the trade-in will be a lot less. Ask about our 90-day same as cash, and financing is also available; just ask our courteous staff and they will give you all the details. Drivability and Diagnostics deal with the smoothness and steadiness of acceleration and automation of a vehicle. When something isn’t running right, you can usually tell. At Brown’s Transmission, we know that getting the proper tune-ups and maintenance will help prolong your vehicle’s life by taking the time to have critical parts maintained. A small, inexpensive problem, when ignored, can turn into a monumental, high-cost mess. Who needs that? That’s why it is imperative to have you vehicle looked at by our professional staff on a routine basis. This will ensure your best chance at keeping your vehicle on the road where it should be. Below are some regular maintenance services and tell tale signs that there may be a problem. When the check engine light comes on, it can mean something as minor as a loose gas cap or something more costly like a bad converter. Sometimes you just don’t know. At Brown’s Transmission, we are here to help. We have all the state of the art diagnostic equipment to let you know what the problem is fast. Don’t ignore that light! Something simple could turn into a real problem if it’s not taken care of in a timely manner. A car’s parts are only as good as the maintenance you put into them, so if you have a check engine light on, come see us or call for an appointment today. Oil changes help to keep car engines clean and running smoothly and also help with wear and friction, leading to longer engine life for your vehicle. By running cleaner, the vehicle will produce less exhaust and emissions. That also gives you better gas mileage, which means more money in your pocket. Your vehicle’s heating and air conditioning system can be very confusing because it involves complicated diagnostics and repair procedures. At Brown’s Transmission, we can take care of all of your heating and air conditioning needs. Our heating and air conditioning mechanics are highly trained and use the latest equipment to maintain and/or repair your vehicle’s heating and air system. When something goes wrong with your vehicle’s AC or heating system, our technicians are standing by to fix your problems right the first time. From water pumps, heater cores, radiators, head gaskets, & thermostats, our highly skilled mechanics are here to assist you with any heating and cooling problem you may have. Keeping your vehicle cool under the hood may only mean a quick part replacement, or it could involve more complicated repairs. At Brown’s Transmission, our professional and friendly technicians will pinpoint your vehicle’s cooling system problems to determine what work is needed and get it fixed. Old coolant/antifreeze can destroy components of the cooling system and even the engine. At Brown’s Transmission, our cooling system services are an important preventative maintenance measure. This service will help prevent the rust, corrosion, leaks, and engine damage that can be caused by old coolant/antifreeze. It will also improve cooling efficiency to provide a more comfortable vehicle environment. This vehicle AC service repair ensures proper refrigerant recovery through evacuation, fill, and recharge, bringing a mechanically sound system back to original performance. Flushing your Engine Coolant is still important . Most mechanics recommend a routine flush every 40,000 miles, or you can check your vehicle owner's manual for recommended coolant change intervals. So now that you know it's important to flush your cooling system, and you can't remember when the last time it was done, call Brown's Transmission Services and Full Service Auto Repairs to set up an appointment. Good tires help your vehicle run the way it was designed and help you travel between destinations safely. Since car tires usually need to be replaced every three to four years, here's a refresher course on how to make sure you're getting the right ones. Most car tires fall into three main types: all-season, summer and winter. Most people buy all-season tires because it's easier and cheaper than buying one set for the winter and another for the summer. All-season car tires deliver a good, well-rounded performance but are never outstanding in any way. Summer tires deliver on handling dry/wet braking, but they have dismal snow traction. By contrast, winter tires have outstanding snow traction but just fair braking ability on cleared roads. REMEMBER..."A bad attitude is like a bad tire. If you don't change it, you'll never go anywhere"
When done at the recommended times, [tire rotation] can preserve balanced handling, traction and even out tire wear. Tire rotation can even provide performance advantages. When should tires be rotated? We recommend that tires be rotated every 3,000 to 5,000 miles even if they don't show signs of wear. Tire rotations can often be done with oil change intervals while the vehicle is off the ground. This can also be a good time to have your tires re-balanced if the vehicle has developed a vibration. it is also a good time to inspect the tires for damage, check for uneven wear by checking your tire pressure. Remember, tire rotation can't correct wear problems due to worn mechanical parts or incorrect inflation pressure.